Jesus used this illustration to show the intimate relationship between the Husbandman/Vinedresser, the Vine and the branch. We can learn so much about this intimacy by studying the natural grapevine. It is the vinedresser who decides where the vine is planted. He knows the nature of the vine, so he lovingly cares for it, watching over it and rejoicing in the fruit it produces. 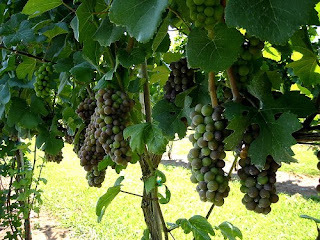 The vinedresser – not the vine – determines the time for planting, the time for pruning and the time for harvesting. The branch is simply a vessel used by the vine. It has the same nature as the vine. Through its sap the vine channels its energy to and through the branch. The branch, then, is a reflection of and a smaller version of the vine. Just as the vine is dependent on the vinedresser, the branch in turn, is totally dependent on the vine. It is only when the branch is one with the vine that it can produce what the vinedresser desires – fruit that reflect the nature of the vine. Jesus, the True Vine, said of the Father, the Husbandman – “The Son is able to do nothing of Himself (of His own accord); but He is able to do only what He sees the Father doing, for whatever the Father does is what the Son does in the same way [in His turn].” – John 5:19. The Father loving and directing the Son... The Son loving you and providing all that you need... You loving the Son and therefore the Father... The Father loving you in turn because of your love for His Son, and the fruit that you bear out of your union with Him. To have an intimate relationship with the Creator of the universe is priceless and divine. Our Father's desire to mold us into the image of His Son is the greatest gift of all. We are truly blessed! Thank you for the lesson on true intimacy between a Father and His children.